How many of you do your makeup on the go? By this I mean while riding the bus, train, or even driving (heaven forbid … but, it happens). On the train ride into my space this morning, I watched as a young woman carefully applied a full face of makeup. First, she smeared on a bright red lip color; followed up with a pinkish tone blush; then a black caked eyeliner. And, just as the train continued to rumble and roar along the tracks, steady hand and all, she painted her lashes with thick black mascara. Watching her reminded me of how when I was in high school, riding the CTA (Chicago Transit Authority) clear across town each day, I would do my makeup. It was a regular part of my morning routine. I had to wake up at the crack of dawn; get dressed; eat a bowl of oatmeal; and head out by 6 AM. I was almost always in a mad rush to catch the 95 East bus so that I would make it on time for 1st period. Putting makeup on before leaving the house just wasn’t in the cards. And, oh yes, my 16-year-old self had to look fly, so makeup was a must! Good thing I had steady hands or else I surely would have poked my eyes out. Truth be told, just like her, I was pretty good at it. Disclaimer: I no longer practice nor do I advocate applying makeup on trains, buses, or while driving. It’s not only unsafe, but SUPER unsanitary. bareMinerals- Cream Puff lipstick, Wild Honey lipgloss, and Flawless Definition mascara. In the mood for a new lip color, I walked into Ulta to see what may catch my eye. The first thing that got my attention was bareMinerals. It had been awhile since I’d used their products, but was recently reminded of how much I like them when I noticed how pretty my client’s makeup was the other day. I was waxing her eyebrows when I examined up close how well her foundation base blended with her beautiful brown skin tone. I was not surprised when she told me that it was bareMinerals. Over the years, I have watched how this makeup line has expanded from a small mineral makeup company, offering a limited range of color tones, to being a giant in the minerals arena. They do a really good job of matching a great range of skin tones, one major feature that many makeup companies lack. After spending about 30 minutes or more contemplating which shades to choose, I finally decided on two. The best part- I got even more than I bargained for when I received an awesome free gift of two full size lip gloss’ and a mascara for being an Ulta club member and spending over $25 on bareMinerals. What a treat! 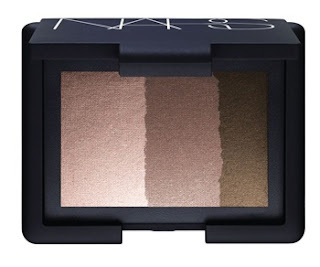 In true NARS fashion they go from vibrant and funky to cool and understated. Look at what they’ve got for us this Spring. 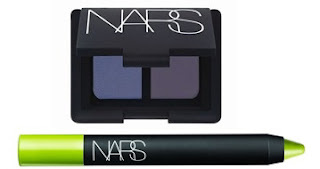 NARS Eyeshadow Duo is a blend of soft shades of blue and purple. The Makeup Color Palette is a vibrant combo of rich hues. The bright yellow green Eyeshadow Pencil lends a shocking splash of color.